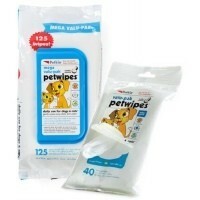 Petkin PetWipes Valu-Paks are the perfect way to get rid of daily dirt and odours that your pet accumulates. Each pre-moistened wipe gently cleanses your pet's skin and fur to remove loose dirt and debris, helping your pet to stay beautifully clean and smelling fresh. The natural cleanser restores and nourishes your pets coat making it nice and soft, while being gentle enough for everyday use even around the eyes, ears and face. 40 Wipes 6" x 8"
125 Wipes 7.5" x 6.7"